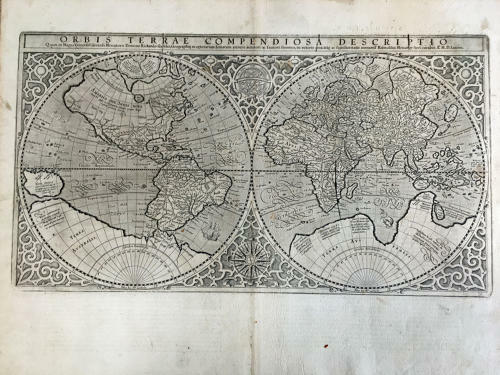 Title: Orbis Terrae Compendiosa Descriptio' printed in Duisberg 1587. Rumold Mercator's stunning map of South America with Latin text on the verso. This influential double-hemisphere world map was created by Rumold Mercator based on the work of his father, Gerard. Gerard Mercator's famous 1569 world map is a cartographic milestone and this map is a condensed version that also contains much speculative information. Note the large southern continent, an unusual delineation for Asia, and the distorted bulge in southern South America. Shirley describes this map as '' a model of clarity and neatness, with typical cursive flourishes to the lettering of the sea names''. The map has a strapwork border, an armillary sphere and an elaborate compass rose. The map is in excellent condition with wide margins. This map is interesting as there is an additional 'antiquarian feature': a mark that extends from central Africa to the southern continent. This appears to have been caused by an excess of ink from the original pressing and is of a different type to the cracks in the plate that appear in the title bar. The shadow at the centrefold is caused by flash photography.